The Adoption Application requests detailed personal information from you. Bulldog Haven NW volunteers may obtain additional information about you through contacts with veterinarians and/or landlords. 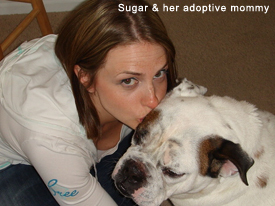 The information is used by Bulldog Haven NW volunteers solely in evaluating your qualifications to adopt a Bulldog in our care and in deciding whether you are the most suitable adopter for a particular Bulldog. Bulldog Haven NW, the Internet Service provider and other parties cannot be responsible for loss or damages to you caused by improper release of information. ATTENTION CORRECTION: If you are re-submitting a new online application upon request (as your app was a previously faxed one) please put RE after your FIRST NAME when you fill out the online app. This small label will help us know it is a re-submission. Thank you for your understanding. Note: BHNW takes the application process seriously; please make sure you do too. We DO NOT ship dogs, please do not ask. We place our dogs within the pacific northwest area and accept applications from those living in WA, OR, ID, MT, and British Columbia Canada. WONDERING HOW THE ADOPTION PROCESS WORKS? Learn about the breed you are interested in adopting if you have not had one before. Make sure this stubborn and often costly to maintain breed is really for you! If it is.. submit a BHNW application, you will want to do this before contacting a volunteer. If you see a dog that you feel you may be the perfect home for, use the email address listed in their bio and let us know you are interested in being considered for that dog and that you have filled out the application and sent it in. Make sure to open up and tell our volunteers anything else you feel they may want to know that you didn't get the chance to write on the application. If you think you may be an excellent fit for more than one dog, please mention it to the volunteer you contact initially and they will pass that information along. Be patient. We wish everyone could get a dog from our organization but the truth is while we do get a number of dogs in, the number of applicants will always far outweigh the number of available dogs. This is a good thing though, since the actual number of homeless Bullies is sad enough as it is. Be sure to respond quickly; we understand that life gets busy, but in addition to finding each dog their perfect home we also try and find them one in a timely manner so the process is as quick and painless as possible for the dogs. If we do not hear from you we may feel you have changed your mind about adopting and will move on to the next application. If your application is being reviewed by a BHNW volunteer for a dog you will be contacted by phone or email to confirm your interest. The volunteer will most likely ask you more questions at this time and share what to expect next in the adoption process. This helps us narrow down applications in order do find the best match for the dog. If your application is chosen as a fit, you will have a home check done by a volunteer who is located near you. You would then be scheduled for a meet-and-greet where the foster parent would meet you at a public place, like a park, where you get the opportunity to meet the dog you are being considered for. If you have a dog(s) in your home already you would also bring them to meet the perspective dog at this time. After all of these steps are complete and you are approved for the dog in question; you will review and sign the BHNW Adoption Contract, pick up your new furry family member, and pay the adoption fee. BHNW holds your adoption contract and payment for two weeks because, well, because stuff can happen. After two weeks BHNW will officially process your adoption and deposit your payment. 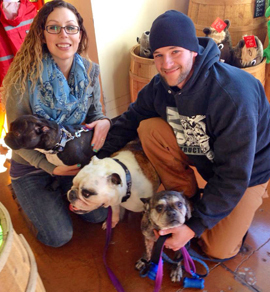 Those funds are immediately turned around to pay things such as more vet bill or dog food for other needy Bulldogs in our care. Please keep in mind that we receive a large number of applications and far more of them than the number of dogs we place. You may not get a dog immediately; sometimes applicants have been waiting a year for the right dog. We are looking for the RIGHT Bulldog for you, it's that simple. We know you want the very best for each and every dog that comes into our care, just like we do. And we're going to do our very best to find a Bulldog that is going to be your best friend for the rest of their life. BHNW Adoption Fees are usually between $400-$800. The fee will depend on the age, health, and temperament of that dog. Our ability to help dogs in need heavily weighs on the generosity of the public and their donations as well as the adoption fees of the dogs in our program. In most cases the medical costs far outweigh the adoption fees. We cannot thank our donors, adopters, and supporters enough; without you we would not be able to help the large number of dogs we do. We accept credit cards via PayPal, money orders or certified bank checks for the full adoption fee at time of placement. dogs listed under Adoptable Dogs.